Norman’s sketchbooks were catalogued by Ann and Mike Thornton & John and Dorothy Cornish, during one week in August 2012. Two hundred and sixty nine sketchbooks were recovered from Norman’s studio in Spennymoor. They provide a remarkable visual journal of his work, capturing and recording the people and places in and around Spennymoor, County Durham and from across the region. Many of the drawings subsequently provided the material for his paintings. 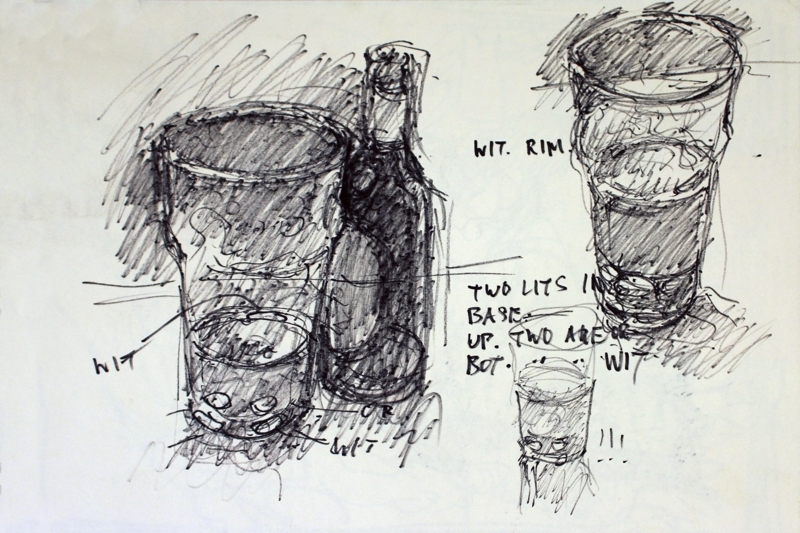 In a conversation with Mike Thornton in 2009 Norman requested that his sketch-books’ have a life of their own and be of interest to people’. Norman was adamant that they should not be cast aside and forgotten, but appreciated in some way. He also suggested ’they should be available for the public to view, to teach people to look at things’. The complete collection has been photographed and consideration is being given to a selection of the work being published and exhibited on different occasions at forthcoming exhibitions. The sketchbooks give an insight into Norman’s approach towards gathering information for his subject material. Early in his career he was encouraged by Bill Farrel at The Spennymoor Settlement to ‘paint what he wanted, what he knew’ and this is a thread which runs throughout all of the sketchbooks. Some subjects appear frequently; bar scenes, man with dog at bar, the pit road,St Paul’s church, Mount Pleasant, men playing dominoes, Berriman’s chip van, South Shields pier, Edward Street, Sarah, Low Spennymoor, men and dogs, character studies and all sorts of interesting unusual subjects such as a bottle-scape and a gas meter. The pages contain colour notes, comments about composition, light and shade, historical information and regular ‘to do’ lists. The sketch books also contain letters and personal observations about a wide range of contemporary topics. Norman often said that painting was like an itch that had to be scratched. Rarely can one town and its people have received so much attention from an individual artist with almost 5,000 drawings and watercolours, some of which will be reproduced in the forthcoming book. He worked on themes repeatedly and almost obsessively, wrestling in his mind to find a faultless composition. Many of his themes can be seen running through different seasons and times of the day and night. The Norman Cornish Sketchbooks will hopefully be published towards the end of 2016 early 2017. You can register interest for it and we will notify you once it becomes available.